Dr: Why are we here today? Me: He is acting lethargic and not acting like himself. I also think he feels a little skinny. Dr: Looks at cat using me as a climbing tree and giving me nose kisses...Lethargic? Really? Well is he eating well? Using the bathroom? Me: Yeah everything else is fine he is just lethargic and not himself. Dr: Ok Let's take his temp.....He looked at me surprised and said he did have a high fever. Then asked me what he is like when he isn't sick. 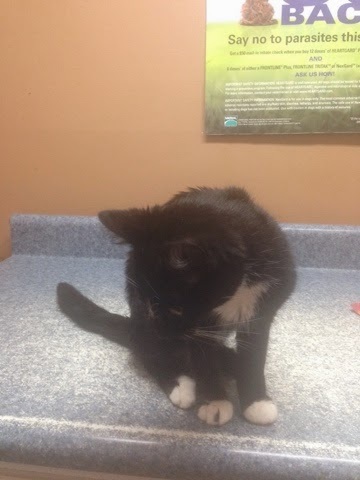 Poor Kitty couldn't fool the thermometer, and after a round of blood work to check for FIV and leukemia we learned he doesn't have anything scary and will get better with a round of antibiotics and a shot of anti-inflammatory meds. 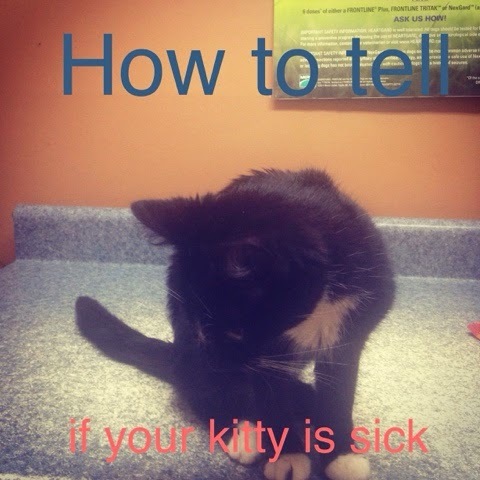 But something I learned if your kitty isn't acting like itself, they can still be sick. Also something I learned. 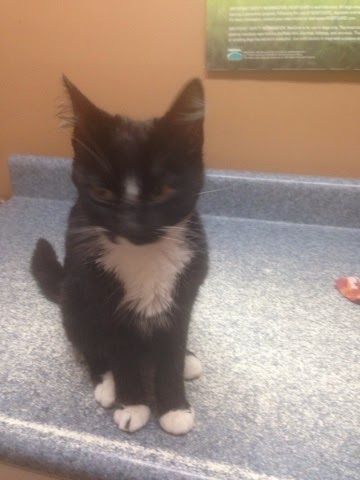 If your kitty is fighting off an infection/virus they will start showing their third eyelid. I didn't even know they had a third eyelid. When you look your kitty in the eye, you will (if they are sick) notice a little white area at the corners of their eye. That's the third eyelid. You can kinda see it in the picture. Another thing I learned the other cats will avoid the sick kitty. 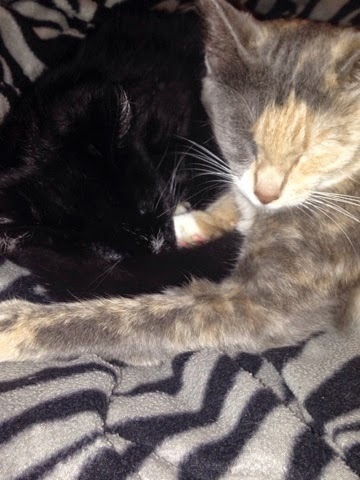 Fenney and Max are usually all lovey dovey, they could snuggle and groom each other for hours. The minute he got sick she avoided him. As soon as he started perking back up thanks to the meds she was snuggled up to him again. This is good to know! Sometimes our dog acts a little less energetic and we always say he's feeling lazy that day, but it's more likely because he's got the dog version of a cold. Although our vet told us he's fine as long as he's eating, so maybe I won't worry too too much. Its hard not to worry. But I know I need to stop. He's eating, maybe not as much as he usually does, but he's still eating. Also he does get up and move around I'm just use to him bouncing off the walls.